Is Akai’s next-gen standalone production system a Force to be reckoned with? If you can stomach the price and eschew your existing setup, Force could become the centre of your studio. Automatic Keygroup multisampling is ace. After a series of photo leaks online ahead of this year’s NAMM Show, the rumour mill went into overdrive, with talk of a ‘standalone Push’. This leak was revealed to be Force, Akai Professional’s new companion to their MPC Live and MPC-X units. Billed as a “standalone music production/DJ performance system”, it’s a fully self-contained studio environment running its own OS on an internal multi-core processor (16GB internal hard drive, 2GB RAM) - no laptop required. 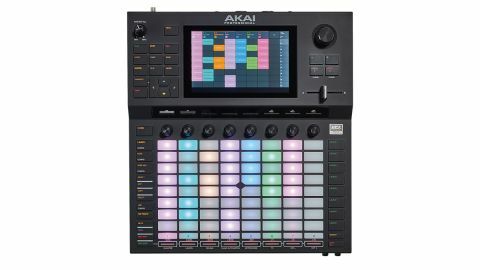 Following in the footsteps of the MPC X, Akai is catering to producers and live performers who want to break free from the shackles of a laptop and controller setup, more specifically the pairing of Ableton’s Live DAW and their companion Push 2 controller, or Native Instruments’ hardware and software hybrid, Maschine. With Force sharing far more than a passing resemblance to the Live and Push combo, comparisons are obvious. Can Akai justify Force’s £1,300 price tag in a world where so many electronic musicians already own a computer, audio interface, DAW software and some kind of MIDI controller? And will this new arrival cause many to ditch all that? Connectivity-wise, this new-generation MPC is certainly impressive. Round the back, signal is routed out via a pair of stereo 1/4” TRS outputs: a Master (1/2) Out and a second pair able to act as either a second stereo aux out or a DJ-esque stereo cue output (outputs 3/4). On the front panel there’s a single 1/4” headphone output with level control, plus a Cue Mix knob for blending between the Master and outputs 3/4 - ideal for, say, testing your outgoing mix before routing it through main speakers, DJ-style. Back to the rear panel, incoming audio signals are plugged into the pair of combo XLR/1/4” inputs (Inputs 1/2), levelled with the Gain knob, and flipped between Line and Instrument levels; while a +48V switch can be flipped to engage phantom power for a mic signal. This flexible connectivity allows you to pipe in (and sample) audio from any source you like. To import your own samples there are a pair of USB A ports (which also handle USB MIDI) and an SD card slot. On the underside lives a 2.5” SATA drive slot, facilitating storage expansion through an SSD or HDD hard drive. For Ableton Link and other connectivity, Force has built-in WiFi and Bluetooth, and you can also connect to your computer manually via the Ethernet or USB-B ports. In true Akai style, Force is also equipped to handle control signals. Space-saving 1/8” MIDI In, Out and Thru ports are present (three 1/8”-to-MIDI connectors are supplied), and those USB ports can also handle MIDI. The four 1/8” CV/ Gate outputs let you control CV-capable gear. Force is stocked with a range of onboard virtual instruments and effects created by respected developer AIR Music Technology. Up to eight Plugin Tracks can be loaded per project, and each can contain one of Force’s four virtual instruments: Hype, a modern digital synth; Bassline, which handles monophonic bass; Tubesynth, an analogue-style polysynth; and Electric for keys. Although the bundled presets can be a little OTT, these powerful synths are fun and intuitive to program on the touchscreen, and are sonically excellent overall. Signal-processing duties are handled by a vast suite of AIR-created effects. These range from mixing processors (filters, EQ, compressors, etc) and modulation tools (chorus, flangers, phasers, etc) through to virtual ambience (reverbs, delays, etc) and more. An interestingly named ‘Mother Ducker’ effect also facilitates sidechain compression and pumping treatments. Again, these all sound great, and are a very welcome addition when working in such a self-contained manner. As with any similarly high priced product, unboxing Force feels quite the event. It disappoints on the ‘portable’ front - at just under 4kg, with a sizable chassis - but this only adds to the luxurious, sturdy feel. If you’re familiar with Ableton’s first generation Push - which Akai helped to create - you’ll feel right at home with Force’s layout. A matrix grid of 8x8 velocity-and aftertouch-sensitive RGB pads commands the lower half, complete with flanking buttons for switching modes, navigating menus, triggering scenes, etc. Above sits a horizontal row of assignable rotaries, each with its own mini OLED screen, which is angled for easy viewing - a nice touch. Force’s upper area is mainly devoted to the 7” multi-gesture, full colour touchscreen. This is gorgeous, and works well, but in use, its touch response is less responsive than, say, an iPad - pinch-zooming, taps and scrolls occasionally don’t register. Thankfully, to the right of the screen sits a chunky encoder, also used for scrolling and click-selecting. This is a comfortable workflow for Pioneer CDJ users, and we often ended up reaching for this knob instead of the screen. Keeping with the DJ aesthetic, there’s a crossfader for mixing and jumping between clips - more on this shortly - plus other navigational buttons (Play, Rec, Undo, etc) and a Master Volume knob. On firing up Force, you’re greeted with a dazzling light show, and the option to open one of 16 demo projects. These show off some of the 10GB bundled sample content from brands like Sample Magic and Sample Tools by Cr2, and although these sessions are great for getting an initial feel, most seem geared to EDM. Most people will instead want to start composing from scratch. A Project opens in Matrix Mode, which is analogous to Ableton Live’s Session View. Vertical columns represent tracks, with cyclical clips running horizontally. In Launch mode, clips can be launched individually, or entire rows can be triggered by tapping the right Launch buttons, done using either the pads or the screen. Navigation and performance playback is executed using the plentiful function buttons and on-screen options. Clips are also easily assigned to either the A or B side of that crossfader and then flipped between, DJ-style, which feels particularly intuitive in a live scenario. A master Project is comprised of several track types specific to Force. Up to eight stereo Audio Tracks can play back imported or recorded samples, complete with auto or manual timestretching; Drum Tracks allow for per-pad sample and kit playback in classic MPC style; and MIDI and CV tracks are used to trigger external gear. We particularly like the workflow and approach of a Keygroup track type: funnel out MIDI to an external instrument, pipe its signal back in, and Force can automatically multisample a defifined set of notes. Great for creating collections of bespoke multisampled patches, ready Audio and MIDI data can be laid down and edited in myriad ways, and although a lot of these options are inspired by the Ableton Push workflow, the touchscreen takes things much deeper. For all except Audio Tracks, Note Mode turns the pads into a keyboard for chromatic MIDI note playback, where the various scale and progression modes can be used to lock your playing in key. The velocity-and aftertouch-sensitive pads are a joy to use, feeling as responsive as you’d expect from the original creators of the MPC. Step-sequencing comes into play when programming Drum Track data: the bottom-left 4x4 pads are for note selection, the bottom-right 4x4 pads become velocity selectors, then you paint in steps on the top 4x8 range. Once you’ve recorded in note data, Clip Edit Mode reveals that data on the screen, piano roll-style. Various touch-editing functions are available, but as mentioned earlier, the sometimes-laggy touchscreen makes this more fiddly than editing in your DAW’s MIDI region on a computer. Then there’s the dedicated Mixer area, which turns the screen into a bank of faders, for full control over levelling, panning, automation and more. Here, you can also tab to your project’s Sends, Returns and Master Out, where processors and aux effects are dialled in across the session. Force takes time to master, even if you’re familiar with Push or Maschine. However, as it’s basically a ‘DAW in a box’, this is expected, and testament to the amount you can do. Once used to it, you’ll find yourself composing in whole new ways. One gripe: despite letting you chain clip playback, the lack of a true ‘song’ mode makes Force more of a sketchpad and performance tool than a true song arranger. This may be addressed with a future update. Next to established computer-powered DAW-and-controller pairings such as Ableton Live/Push or NI for playback. Maschine, Force’s value proposition does come into question. It’s far from within an entry-level producer’s price range, yet many advanced musicians will probably already own a laptop/ controller setup that’s as portable as the weightily-sized Force. Plus, cost aside, your existing computer-and-audio-interface rig is far more powerful - you can run unlimited track counts, call up your favourite third-party instruments and effects, linearly arrange entire compositions, and more. Taken on its own, however, Force is an undeniably impressive standalone system that can effortlessly handle almost every aspect of electronic music creation, sequencing and performance. Not only can you compose, perform and remix tracks on the fly internally, but you can also trigger, play back and sample all of your external MIDI/CV hardware, making it a true studio hub. If you’re willing to commit, Force just might be your new MPC for the modern age.